to reinvent old wardrobe remnats while wearing garments from the past - like this vintage bag, my little brother's pajamas (complete with pockets - this is going to be my new styling go-to on lazy days...), an old beanie from middle school days. These Anne Klein gladiator heels are the first pair of heels I ever purchased for graduation in 2008 (besides my tacky prom shoes), from TJ Maxx. I remember discovering fashiontoast in fall of senior year (2007) and lusting over all her shoes :) Gladiator was big, and so were t-strap sandals. The tank was a clearance purchase from F21 (definitely <$5...) during college. Bridging my middle school, high school and college days to the present with a recent rainbow jacket purchase. The jacket is so awesome! Wow cool outfit doll love the shoes. 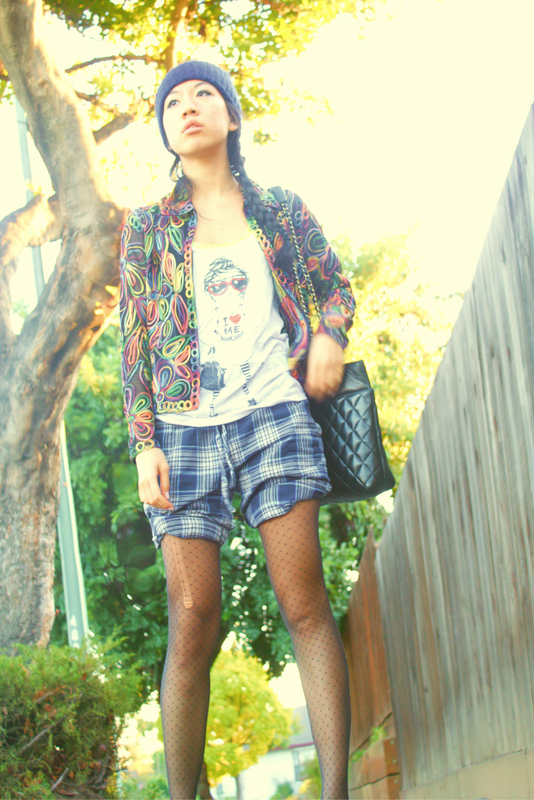 I love jacket and shorts!!! Merry Xmas! This eclectic and colourful style looks amazing on you. Love the energy and how you styled it. Great blazer and mix of prints! Following you now & definitely looking forward to seeing more. such a lovely jacket, really love this look! thnx for following me I followed you too on GFC and bloglovin dear! I'm your newest follower on GFC and Bloglovin! Beautiful jacket and shoes ! Very nice look ! Thank you for comment and visit on my blog ! Great job styling this outfit and the pieces you used! I hope you and your family are having a very Merry Christmas!! it's the hobo life hehe ;) pjs as shorts = new uniform though. seriously. Thanks for visiting my blog Vivian! Love your blog also. I've followed you as well. 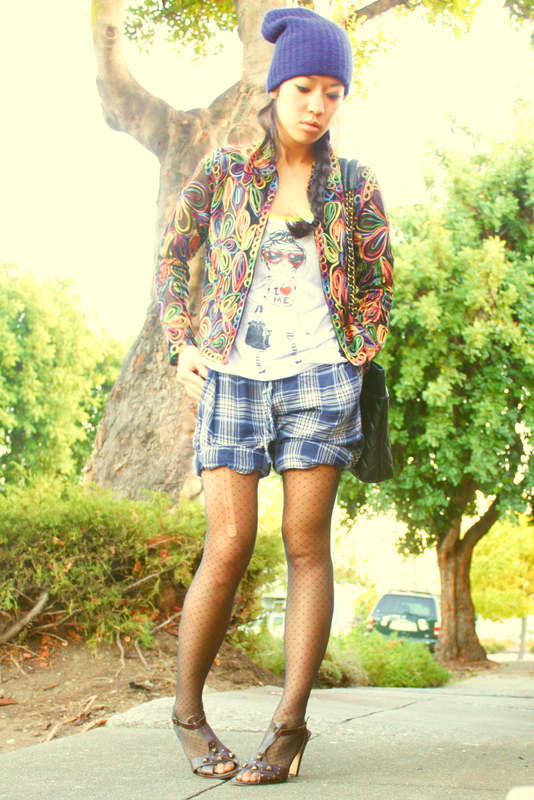 Cute and funky spin on grunge - love it!